The holiday season is such a whirlwind. Once January rolls around, it's easy to feel exhausted and kinda like the past month was a blur. After the plethora of holiday activities, our eating, sleeping and exercising routines may be out of whack. It can be tough to get back into the swing of things. One way to ease this transition is to simplify meals. Make sure you are getting well-balanced meals is a great start to the new year. And there’s no need for this to be complicated! I am all about reducing decision fatigue! So I've put together some easy tips on how to build delicious and nourishing meals. Protein: this component includes both plant- and animal-derived protein sources. I recommend incorporating at least one plant-based protein source per day. Plant sources promote health thanks to the fiber, vitamins and minerals they contain. They are also better for the environment and easier on the budget. Starch: this category includes processed and whole grain varieties as well as starchy vegetables. Processed starches include white rice, white bread, white pasta crackers, chips. The more whole grain you eat, the better for your health. Whole grains are packed with fiber. Fiber is essential for digestive health. It also help prevent spikes in blood sugar levels and can even lower cholesterol levels. Whole grains also contain essential micronutrients that may protect against some cancers. Vegetables: this group refers to non-starchy vegetables. Aim to get different colors of veggies throughout the week. They each have different nutrients so variety equals balance. Vegetables are also an important source of fiber in your diet, helping promote gut health and heart health. Healthy Fats: this category refers to the fats we cook with, use to garnish dishes or that are inherent in certain food items. You might notice most of the items in this category come from plants. These items provide unsaturated fats - the heart healthy kind of fat. Unsaturated fats can improve cholesterol levels and reduce inflammation in the body. The healthy fats that provide essential omega-3s are listed with an asterisk (*). Nuts + seeds: almonds, hazelnuts, pecans, walnuts*, peanuts, pistachios, brazil nuts, pine nuts, cashews, pumpkin seeds, sesame seeds, sunflower seeds, nut/seed butters, etc. I generally don’t prescribe specific portions of food for clients to eat. Why? Because it’s important for you to check in with your body and your hunger level. That will help you determine how much you want to eat in any given moment. At some meals you may be hungrier than at other meals and that is totally okay. No one should have to eat the same exact portion of food at each meal (although if that is how your body works best, that is fine too!). One other thing to mention is that this is only a recommended eating style, not a rule. Don’t fret if some of your meals have different percentages. You may have some meals that have very few vegetables and other times when your meals are mostly vegetables. One meal or one day’s eating habits are not going to have negative health outcomes. 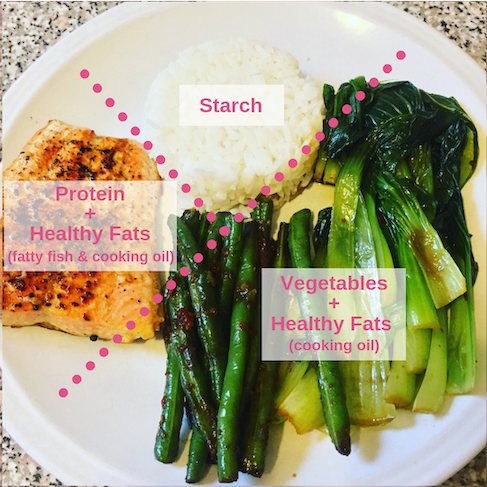 It’s the overall eating patterns that matter! I love fruit too much to forget about it! The Harvard Healthy Eating Plate includes fruit as a component for each meal. I’m totally cool with that. In this case, I recommend keeping the plate distribution the same and adding a piece of fruit as a side item. Being flexible is key to enjoying meals without guilt. The recommendations listed above are all meant to be guidelines, not strict rules. Don’t be discouraged or ashamed if a meal, a whole day or even a whole week of eating doesn’t match up. Every eating occasion is a new opportunity to try out the recommendation and see how you feel. If you like to plan meals for for the week, don’t forget to incorporate flexibility too. I frequently hear meal plans described as a rigid schedule that you must follow - regardless of how you are feeling or what you want to eat in the moment. That can feel stifling. It can also take some of the joy out of eating and being social. So let’s redefine meal planning: It's a flexible list of meal options that helps you nourish yourself by being prepared. Key to that definition is the work “flexible”. Life can be unpredictable. So it’s important to be able to adapt your eating plans to whatever comes up during the week. For example, I planned to make a pasta dish this evening, but I’m actually craving sushi. Just because I planned to make pasta doesn’t mean I absolutely have to do it. No one is forcing me to (unless I force myself). I may be more satisfied if I go for the sushi and make the pasta tomorrow. Or, I may decide my sushi craving can wait and still make the pasta. The important thing is that I have options - and so do you! The benefits of a flexible meal plan are important to note. A plan can help you build a grocery list so you know what to buy and feel prepared. It also gives you an idea of what kind of meals to make for the week based on your schedule. Then you can decide what you feel like eating in the moment. Meal planning can help reduce food waste too. For example, if you know you’ll be too busy to cook in the next 3 days, you may choose to not buy produce that goes bad quickly. Whew! That was a lot. I hope you aren’t feeling overwhelmed. 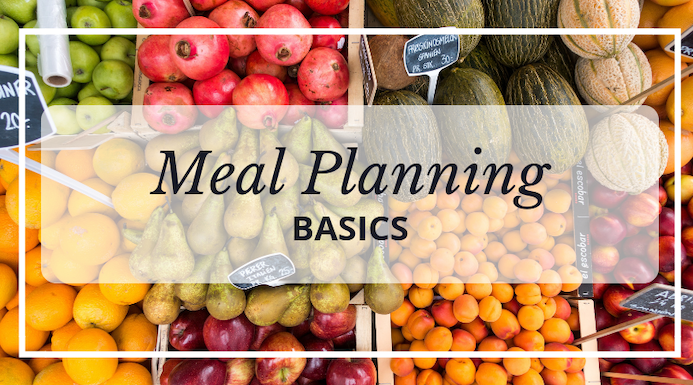 The whole point of this post is to help you simplify meal planning and prep. I also wanted to give you a variety of food options you can choose from when implementing the recommendations. Well balanced meals have at least 4 food components. The recommended proportions = 50% vegetables + 25% protein + 25% starch + healthy fats incorporated throughout. Aim to eat at least 2 types of fruit per day. Above all, be flexible! One “off” meal or day of meals will not destroy your health. It’s the thick of the holiday season & the first day of winter. There’s so much hustle & bustle, social gatherings and work projects to wrap up before the end of the year. The last thing you need right now is to get sick. 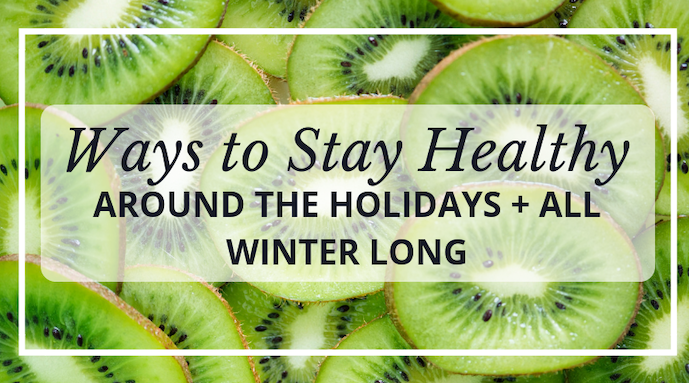 So I’ve put together some ways for how you can keep yourself healthy during the holidays. Much of this likely isn’t a surprise to you, it can serve as a helpful reminder. You can also use these tips during the winter to prevent getting sick too! It can be super easy to fill up on cookies, cakes & holiday beverages with all of the holiday parties this month. There’s absolutely nothing wrong with partaking in the goodies. But remember that your body still needs its basic nutrition needs met. It’s important to get enough calories and nutrients to keep your body running smoothly. This is key considering how busy many of us are this time of year. We need to be getting a variety of fruits, vegetables, whole grains & lean proteins for nourishment. One simple recommendation I often tell clients is to aim for at least 3 servings of veggies and 2 servings of fruit per day. The antioxidants in these items support your immune system. Research tells us that getting enough calories and protein is important for immune defenses. There are specific vitamins & minerals that are essential to supporting our immunity. These micronutrients are listed below. My recommendation is to try to eat some of the foods listed below on a regular basis. Please note that this is by no means an exhaustive list of foods with these nutrients. I’ve simply identified some of the foods and food groups that have the highest content of each vitamin or mineral. Science is learning so much about our gut microbiota and symbiotic relationship they have with us. One fact we have learned is how important the beneficial bacteria are to our immune system. It turns out they help stimulate it to work properly through signaling properties. Promoting the survival of the good bugs is also essential to helping keep out harmful (or pathogenic) bacteria. The best way you can support your gut microbiota is to eat enough fiber. Fiber provides prebiotics, which is the food for our microbes. Fiber comes from plant foods: whole fruits (not juice), vegetables, whole grains and plant-proteins like legumes, beans, nuts & seeds. Some of the best probiotic foods are: apples, artichokes, asparagus, bananas, barley, garlic, Jerusalem artichokes, leeks, mushrooms, oats, onions, and soybeans (tofu, edamame, etc.). Stick to water most of the day, leaving other beverages for special occasions. You’ll know if you’re drinking enough when your urine is usually light yellow to clear. If it’s dark yellow (& you didn’t recently take a vitamin), then that’s a clue to start hydrating yourself. If you have a hard time with room temperature or cold water, go for a hot tea. Sometimes I’ll even heat up water to drink as is, or even with a squeeze of lemon. For every alcoholic beverage, drink one glass of water. Add soap & rub hands together. Lather & scrub all areas of your hands for at least 20 seconds. If you aren’t sure how long that is, sing the “Happy Birthday” song twice. Dry hands using a clean towel or air dryer. If you don’t have access to a sink to wash your hands, the next best option is an alcohol-based hand sanitizer. The flu vaccine s the best way to protect yourself from getting the flu. It has been shown to reduce the number of flu illnesses and hospitalizations. The shot can even help reduce symptoms in the event you get the flu. It’s important for herd immunity, which protects individuals who can’t get the vaccine for medical reasons. Plus it’s free in most places so there really is no excuse not to get it. The CDC recommends everyone six months and older get an annual flu shot. If you want to know more about the vaccine, how well it works and safety information, check out the CDC’s website. P.S. it’s not to late get your flu vaccine! Contact your doctor’s office or check out your local pharmacy. This can be a challenge when there are holiday parties to attend, final exams to take & work deadlines to meet. But your body does so many important things when you sleep! Keeping you healthy is one of them. If you start to feel under the weather, make sure you get as much sleep as you can. A good benchmark is to shoot for 7-9 hours per night on average. Regular exercising can boost your immune system. Try to keep up with staying active to the best of your ability during this busy season. But also beware of over-exercising or over-extending yourself. Give yourself the flexibility to modify your exercise routine based on how you feel. If you usually do super intense workouts but feel run down, try a restorative yoga class or a calm walk on the treadmill. It’s even okay to skip a workout if needed. Give yourself that option sans the guilt. How do you keep yourself up and running in the cold weather months?